Christmas may well be the time for goodwill to all men, but your goodwill will be in very short supply if you’re caught out by a Christmas online scam. Consumers are increasingly spending their hard-earned Christmas present cash online, and scammers tap into this market by developing ways to divest you of the cash. These scams are becoming more and more sophisticated so if you’re one of the millions of UK consumers who’s sitting down at their PC to do most of their Christmas shopping, you need to know what to be on your guard for. If you have a half decent spam filter on your email account, the chances are that most of these emails will be filed straight in the junk folder, which is a good indication that they are, in fact, rubbish. If an email slips through into your inbox, it might look genuine but ignore it. The email resembles a delivery notice or invoice from Fed Ex, UPS or U.S. Customs Service. Of course if you haven’t ordered anything to be delivered using one of these services it should also be a dead giveaway. So should the fact that they ask for a credit card number in order to set up a credit or ask you to open an online account to receive your package. It hardly need be repeated but genuine companies will never ask you for financial details via email. Don’t do it, delete it. If you find a slightly suspicious looking friend request in your inbox, don’t click on the link because it’s likely to infect your computer with all sorts of viruses and malware that will steal personal details and use them against you. Even if you have a lovely festive message with your friend request, the best way to make sure it’s genuine is to log on to the site itself and check. Even worse, scammers have been hijacking festive cheer by sending out fake e-cards, which contain worms that get into your computer and can wreak havoc, sending the same dodgy cards out to everyone in your address book and getting hold of details they shouldn’t. Last year, McAfee found worms in fake Hallmark e-cards and also in fake McDonald’s and Coca Cola holiday promotions. There are often worms and malware enclosed in those ‘cute’ power point themed presentations too, so beware and don’t click on links. If you’ve forgotten the words to ‘Good king Wenceslas’ – ask someone! 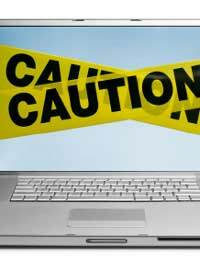 Don’t try and download the lyrics online - McAfee found that some lyric sites download more than words; they can also give you a dose of viruses, adware and spyware. Make sure that the fantastic bargain you’re bidding for online actually exists – and that you’re not being scammed by a completely fake auction site. If you’re invited to bid via email, don’t even think about it, because of course the link will take you through to a completely fraudulent replication of the site in question and you’ll just end up giving all your financial information to scammers and criminals. Don’t get caught out by online scams this Christmas, be vigilant when opening emails, always be wary when clicking links - even if they come from people you know. The main things to look for – and avoid – are URLs (click this link for...) jpeg and .ppt files which can all hide malware. For the full twelve scams of Christmas, go to the McAfee website.